Will this transferring to Ancestry.com mean that they will have access to all and then CHARGE people to view the information? That is why I quit putting info into Family Search because it happened with another site that I had entered information. I never plan to PAY for what was freely given. I didn't know familysearch was incorporated with ancestry.com. When did that happen? A recurring misunderstanding in the genealogy community is the mistaken belief that Ancestry.com owns FamilySearch. That is not the case. Perhaps you are worried about the partnership between the two. Let me address that in a moment. First, let me talk about ownership. Acquisitions have made it challenging to remember who owns whom at any given moment. Ancestry.com has acquired RootsWeb.org, Genealogy.com, iArchives and its property Fold3.com (formerly footnote.com), We’re Related, Genline.com, Archives.com, 1000 Memories, and most recently, FindAGrave.com. Genealogy.com was a powerhouse in its day and through it Ancestry.com inherited Banner Blue’s Family Tree Maker, World Family Tree, GenForum.com, and Automated Archives’s Family Archive CD library. Ancestry.com also owns MyFamily.com and Newspapers.com websites. Strategic partnerships further muddle the waters. In August 2008 Ancestry.com established a strategic partnership with JewishGen. Ancestry.com now owns and operates the servers that host JewishGen.org. In exchange, Ancestry.com gets to publish many JewishGen databases. Those are available for free on Ancestry.com with its powerful search technology. If Ancestry.com has acquired enough of their content, why acquire them? In September 2013 Ancestry.com established a strategic partnership with FamilySearch. (See “Ancestry.com Announces Extensive Partnership with FamilySearch” and “More Information on Ancestry.com/FamilySearch Agreement.”) Ancestry.com gets to publish many FamilySearch databases. In exchange, FamilySearch gets the privilege of collaborating with Ancestry.com on several projects. If Ancestry.com has acquired enough of their content, why acquire them? What do you mean by transferred? Information is being shared, not moved. FamilySearch has repeatedly reiterated that the content given to Ancestry.com will continue to be available and free on FamilySearch.org. I don’t think either party has disclosed whether all FamilySearch information will be given to Ancestry.com. Given that some FamilySearch record collections are available only to members of the Church of Jesus Christ of Latter-day Saints, I think it is safe to say that not all FamilySearch collections will be transferred to Ancestry.com. I don’t think they have disclosed whether or not user-contributed content will be shared, although the FamilySearch terms and conditions allow it. They haven’t disclosed whether Ancestry.com will charge for the information, although in the past I’ve pointed out databases from FamilySearch that Ancestry.com does charge for. I’m curious about the collaborative projects. Ancestry.com and FamilySearch collaborated on the U.S. censuses. Now for some censuses users must pay for access to images, even though FamilySearch created the images and FamilySearch volunteers helped create the indexes. I hope they won’t be doing any of those kinds of projects! Let me talk about two other organizations. In a campaign to highlight new collections added in 2013, Ancestry.com is offering free access to select collections today and tomorrow. Free access ends 29 December 2013 at 11:59 PM Eastern Time. Access to the collections requires a free account which can be obtained without providing credit card information. You will receive promotional email, which you can subsequently opt out of. Thank you, Thomas, for sharing. Click to listen to O Come, O Come, Emmanuel by The Piano Guys. Source: "United States Census, 1940," index and images, FamilySearch (https://familysearch.org/pal:/MM9.3.1/TH-1971-27840-3031-56 : accessed 21 Dec 2013), New York > New York > New York City, Manhattan, Assembly District 19 > [Enumeration District] 31-1707B…, Images 33-7 of 38; household 338, sheets 81A-83A, NARA digital publication of T627, roll 2665. A quality image of an original source has virtually the same evidentiary value as the original and avoids transcription errors so prevalent in derivative sources. Last week FamilySearch added the ability to attach a photo or document image to a FamilySearch Family Tree source. Use the usual method to create a source. On the person’s page scroll down to the Sources section and click Create a New Source. Selecting this new choice replaces the text box with the Attach File button. Click the button to see thumbnails of all your photos and documents. Select one or click the Upload button for a new photo or document. You’re almost finished. You’ve gone to all the trouble of scanning and attaching an image of a source. To preserve its evidentiary value, don’t forget to specify a citation! Sadly, altered images of sources exist (think of the four or five different certificates of President Obama’s birth). Even if you obtained the image second hand, specify where you got it from. Your sources are the only hope we have of cleaning up FamilySearch Family Tree. Get going! Edit links have been removed, as well as temple options. This forces members of the Church of Jesus Christ of Latter-day Saints to switch to Family Tree. Because the two databases are still being synchronized, IOUSes will still not be combinable in Family Tree. I don’t recall if FamilySearch has given a date for turning off the synchronization between the two trees. Has anyone heard anything? Whatever you’ve heard, my sense is that we will continue to live with that limitation for a long, long, long time. It was my intent to write about another feature of Family Tree, but Wednesday night as I attempted to do so, the FamilySearch website was malfunctioning. I’d had other problems earlier in the day. I had seen server errors and website timeouts off and on the entire day. I wondered if it was just me so I tried the http://www.downforeveryoneorjustme.com/ website. Enter the name of a website and the “Down For Everyone or Just Me” website will check it for you. If the website (in this case, FamilySearch.org) is down for everyone, it will tell you so. It was. Wednesday night, when viewing the list of persons tagged in a document, the links to Family Tree wouldn’t function. I switched browsers from Firefox to Chrome and Internet Explorer. In these browsers, the errant links were completely missing, as were the red exclamation points indicating non-linked persons. In Firefox (left), links to Family Tree were non-functional. In Internet Explorer (right) and Chrome, the links were non-existent. FamilySearch.org works most of the time. But I’ve had problems at least once a day this week. More weeks than not I have at least one problem and often more. I try .. .. … …. …….. and ……….. … … FamilySearch.org, but …. …. … …... …… … .. ….. I am happy to announce that I will be speaking at RootsTech 2014. I am teaching “Do It Yourself Photo Restoration.” I’ll present the topic once in a regular session and twice in hands-on labs. My syllabus is 39 pages long! (it has lots of photos, as you might expect.) I was nervous about the length, but I asked info@rootstech.org and an unsigned reply said it was OK. That’s a lot of translating for 10 languages! I appreciate RootsTech’s investment. Restore that photograph to its initial splendor. Repair colorcast. Restore tonal range. Eliminate blemishes. Get the most from your scanner. We’ll be using free software, since many people don’t own PhotoShop. But the principles are universal. That adds to more than 238 because some sessions are counted in multiple skill levels. The idea behind “Unconferencing” sessions is that the session attendees do the presenting. You may have a moderator or organizer, but attendees do all the talking. I’ve wondered how much RootsTech has caught on among advanced genealogists. Most don’t have the means to attend NGS, FGS, and RootsTech. Is there enough draw for them to divert money from the established conferences? I filtered the sessions by Advanced, and was pleased to see sessions by Pamela Weisberger, Laura Prescott, Judy Russell, Curt Witcher, and Elissa Scalise Powell. I should not have gone down the path of mentioning specific names because there are plenty of nationally recognized experts whose names I don’t recognize (early-onset dementia). My apologies to the rest of you. But you don’t have to trust my recall abilities. You can see the sessions yourself at https://rootstech.org/schedule-info/session-viewer/. I look forward to my presentation and hope to see you there, if not in my session, then somewhere at RootsTech 2014. It’s a good idea to post a watch on eBay on your surname. When a matching item comes up for auction, you receive notification by email. You never know when a family Bible or something else of value might show up. Fortunately for Dee Grimsrud, she did just that. The passing of an older generation is poignant, perhaps even more so for a genealogist, since we are so focused on our ancestors and their memories. Dee lost her mother in 2007. Her grandparents had passed back in the ‘60s. One of two uncles died back in World War II. That leaves her with just one uncle from her Mother’s family. A seller on eBay with the username “junybean” likes old stuff and frequents auctions, buying things despite her husband’s objections. Some time ago she bought a box of old books at an auction near Oshkosh, Wisconsin. Earlier this year junybean needed some cash to pay for a car repair bill, so she put the books up for auction. That triggered the watch Dee had established and she received an email notification of the Grimsrud listing. She clicked through to examine the items. “Imagine my surprise,” wrote Dee to me, “to zoom in on photos of various pages containing my grandmother's very-recognizable handwriting, and snapshots of various family members, including my mother as a young girl!” She immediately contacted junybean who got special permission from eBay to cancel the auction so she could get the scrapbooks to Dee. Dee and her family wonder where the books—which no living family member knew existed—had been all those years. How had the books left the family and made their way from Milwaukee to Oshkosh? Junybean told Dee, “It actually makes me think that there was some sort of divine intervention to help you locate these.” Dee’s best friend calls it “genealogical karma,” Dee’s reward for helping so many people as a reference archivist at the Wisconsin Historical Society as well as helping numerous friends and acquaintances. Thank you, Dee, for sharing. P.S. Dee recommends creating carefully worded watches on eBay for family surnames, clarified with place names and or other focusing keywords. Sources: Dee Grimsrud ([email address withheld for privacy]) to the Ancestry Insider (AncestryInsider@gmail.com), emails, “Another ‘Serendipity in Genealogy’ Story,” 13 September 2013 and 14 September 2013, privately held by the Ancestry Insider. In its November 2013 user newsletter, FamilySearch said a number of interesting things. CEO, Dennis Brimhall responded to criticisms that the FamilySearch.org website changes too much. “It can be very difficult for those of us who didn’t grow up using the tools of technology to keep up with this ever-evolving revolution,” said Brimhall. He said that FamilySearch has to balance the human cost of change with the benefits that those changes bring. You can read the complete text of Brimhall’s message on the FamilySearch blog. Currently, navigating around the FamilySearch.org site can be less than optimal. As I’ve mentioned, they recently added a site map. The newsletter gave a sneak peak at an upcoming user interface change designed to make navigation easier. The change will provide a drop-down menu if you hover over the current navigation buttons, as shown in the illustration to the right. The newsletter reminded users of the upcoming RootsTech conference. “Whether attendees are just beginning their family history, an avid hobbyist, or an experienced researcher, RootsTech has something for everyone.” For more information, see “Announcing RootsTech 2014 Registration and Limited Time Discount” on the FamilySearch blog. FamilySearch will be adding a new “My Indexing page.” (Better not tell Ron Tanner. He’s finally making headway on getting users to replace the word “my” with “our.” :-) Your My Indexing page will show the batches you are working on, messages you have received, progress you are making, groups you are a member of, and activities and achievements of yourself and your friends. The indexing program itself will roll out in stages throughout 2014. The illustration to the right is called a “mockup.” That means it is suggestive of how the tool might look. When it is eventually released, it may or not look like this. You will be able to use the indexing tool directly from the indexing project page or from the project list. All the familiar data entry methods and toolbars will be present, as well as new ones. Batch selection will allow more than just project selection. You will be able to look into certain projects and pick by location or time period. For more information, see “The Future of Indexing” on the FamilySearch blog. I would give you a link to see the entire newsletter on a webpage, but I can’t find a way to do so without giving out my private email address. Can somebody at FamilySearch fix that? Until such time, you’ll have to settle with the links that I have provided. As the year approaches a close, I thought you’d like to see some stats reported in the November FamilySearch Indexing newsletter. I am honored to again be chosen as an official blogger for the upcoming RootsTech conference. The RootsTech conference will be held this year a little earlier than previous years. It will be held from the 6th to the 8th of February 2014. It will also be held in larger meeting spaces. While still in the Salt Palace Convention Center, it will be held in the older, larger, East side of the building. This is a welcome change. Ree is an award-winning blogger and New York Times bestselling author. Her popular website, The Pioneer Woman, was founded in 2006 and showcases her cooking, photography, and stories about country life. Annelies is changing the way digital genealogical records are published and organized. Her company hosts 1.8 billion genealogical records across a family of online brands. Judy is a certified genealogist with a law degree who enjoys helping others understand the interplay between genealogy and the law. She blogs and maintains The Legal Genealogist website. The Indiana Jones of genetics, Dr. Wells has traveled the world and captured the DNA of more than a half-million people to tell the story of the human journey. Behind every door there is a story. This TV series consists of random door-to-door interviews to discover who lives behind those doors and their real stories. Stephanie's story of survival and recovery after a plane crash captured the hearts of the nation. She has inspired others through interviews with Oprah Winfrey and on the Today Show. You can find a complete list of official RootsTech bloggers on the RootsTech website. I have been indexing immigration records. I am now questioning the value of these records. They do not indicate where the immigrant came from. No relationship is given. What is the value? Should we be blindly indexing records or should we be indexing the most valuable records? I assume you are indexing ships’ passenger manifests. The earlier the record, the more sketchy the information. Even without this information, these records can be extremely valuable in making that all important hop across the pond to your ancestor’s old home. Families, neighbors, and friends often traveled together, making it possible to pick your ancestor out of a sea of badly identified immigrants. Arrival dates and ports can be cross-referenced with published sources (like Allen’s Directory or contemporary newspapers) to learn departure ports. Knowing when, where, and with whom your ancestor left Europe can lead to further records and clues. Indexing ships’ passenger lists opens these records up like microfilm never could. Previously, one had to search port by port, year by year, and ship arrival by ship arrival to find a potential ancestor. A search that previously might take a lifetime can be performed in indexed records in a fraction of a second. I applaud your desire to focus your valuable time on indexing valuable records. As you review the list of available projects, I hope you will consider immigration records. In my opinion, an index comprehensive across time and ports is well worth creating. Here’s an interesting entry in FamilySearch Family Tree: Barbara Defty married herself and had a child when she was eight years old. This introduces an interesting conundrum. Do you fix it? The answer is not as simple as you might think. Gender-specific names don’t always guarantee gender. David Rencher’s father was named “Joy” (see “Darned Gender-Specific Names”) and David tells me that there’s an area of Arizona with several men of that name. Changing entries in the tree without proof is a no-no. Some “helpful” person “fixed” the entry of his father, Joy Rencher, son of Jay Rencher. Obvious typo? The birth certificate plainly shows otherwise. Given that you should have proof before making changes, proving a negative is very difficult. This particular alignment is possible, no matter how unlikely. Consulting the source might easily show the thinking of the contributor. However, FamilySearch doesn’t require sources and in this particular case the contributor did not specify any. Information about Barbara might make it possible to find the source yourself. However, the contributor specified no specific birth date (“before 1765”), no specific birthplace (“England”), no specific death date (“deceased”), no credible relationships, and nothing else (besides the name). If the source for the contribution had been legacy Ancestral File or Pedigree Resource File, then you would not be able to discover who the contributor was, let alone contact them or their descendants. FamilySearch refuses to disclose the contributors’ contact information, even though the submission agreement explicitly gave FamilySearch rights to do so. In fact, the old FamilySearch.org website did disclose contributors’ name and contact information. Why FamilySearch refuses to do so now is… well, I can’t think of a way to end that sentence without getting myself in big trouble. Darned FamilySearch. Some of its policies and procedures are making it difficult to create an accurate Family Tree. The conclusion resulting from an atomic operation is itself, a record. In other words, the entry for your James Smith in FamilySearch Family Tree is a record. When you find a historic record about a James Smith, the decision that the historic record is about your James Smith is atomic genealogy. I believe this census record about James Smith should be attached to this James Smith in the tree because they have the same name, the approximate birth year from the census (1879) matches the birth date in the tree (2 June 1880), the wives’ names are the same (Mary), and the names and ages of the three children in the census household (Susan, David, and Tom) match three of his five children in the tree (Susan, David, and Thomas). When Family Tree asks for your reason for attaching the record to the tree, do you enter all this? Or is it all self-evident? Keep in mind that after you attach the record, the values in the tree might change. Is your time better spent otherwise? I’ve been told that most people leave the reason blank. Is that okay? Records Say the Darnedest Things: Darned November 31st! I am very displeased that the main library will no longer have consultants after 7 pm and on Saturdays. It is sad to have such a nice facility and not have expertise available to answer difficult questions for which the missionaries are not trained to handle. In a subsequent post, Jaffa verified this to be the case. “While the number of consultants was reduced, the number of on-duty consultants during the daytime has been increased,” he said. The Family History Library is open more hours, provides more computers, printing options, and professional help than any other genealogical library, society, or archive in the world. We remain committed to providing all of these services free of charge to patrons from all over the world. From my experience, that is certainly the case. When I visit court houses, libraries, and archives, I fully expect them to be closed evenings, weekends, and one or two weekdays. Always check beforehand before travelling a long distance to visit one. At the National Archives (NARA) in Washington, D.C., one limitation is that the staff that retrieves items from archive shelves works only during the workday. However, you can continue to use the items into evening hours and the weekend. Thus, to best utilize a visit to NARA, it is important to order enough materials during the workday to keep you busy during the subsequent evenings and weekends. You might approach the Family History Library similarly. if you need advanced research consultations, work them into your afternoons so you have enough to do to keep you busy in the evenings. Arlington, VA, 20 NOVEMBER 2013: The National Genealogical Society is pleased to announce the program for the 2014 Family History Conference is now available in a sixteen-page Registration Brochure, which can be downloaded at http://goo.gl/KwHTix. The online version of the program is also available on the conference website at conference.ngsgenealogy.org. Conference registration opens on 1 December 2013 at http://conference.ngsgenealogy.org/event-registration/. A number of special events have limited seating, so register on 1 December or as soon as possible thereafter if you plan to attend these events. Founded in 1903, the National Genealogical Society is dedicated to genealogy education, high research standards, and the preservation of genealogical records. The Arlington, Virginia- based nonprofit is the premier national society for everyone, from the beginner to the most advanced family historian seeking excellence in publications, educational offerings, research guidance, and opportunities to interact with other genealogists. This is a follow up to “Monday Mailbox: World Family Tree.” Ancestry.com said that World Family Tree was not available on Ancestry.com. Reader John had further insight. I do not believe that answer is correct. Several years ago, Ancestry had a database in their collection that was called, I believe, "Ancestry World Tree". It was supposedly composed of "stitching" together information from trees and various of their databases. I was told by Ancestry personnel that the World Family Tree information was included in that database and the source tab could actually direct you back to the original tree. I am sorry that the World Family Tree database does not seem to be available any longer as it was a great source of clues. Some of the early WFT disks had some excellent material on them. As a follow-up question... I have dozens of the CDs from FTM, including many WFT CDs. Current FTM does not read them; how can they be viewed? Does ancestry have a version of their viewer that runs on current versions of Windows? John may be correct, although it was OneWorldTree, not Ancestry World Tree. Ancestry World Tree was a collection of user-submitted GEDCOMs. See “Ancestry.com Dendrology 101: Ancestry World Tree.” OneWorldTree was a machine stitched single tree formed by merging individual GEDCOMs. See “Ancestry.com Dendrology 101: OneWorldTree.” I never heard definitively, but there was talk that WFT GEDCOMs might be included. For years, both OneWorldTree and Ancestry World Tree continued to be available, even while they were increasingly deemphasized. It became harder and harder to find links to them, but if you could find them, they still worked. Sometime since the last time I checked, they have been completely removed. However, Ancestry World Tree is still available as WorldConnect on RootsWeb.com. John also asked how to view old FTM disks, including WFT disks. Debbie in Northern Nevada informed him of the Family Archive Viewer, available at http://www.genealogy.com/abtffiv.html. Michigan Girl said that it hadn’t worked for her under Windows 7. Has anyone else tried it under Windows 7? Are there compatibility settings that can make it work? FamilySearch recently rolled out a new logo, obsoleting merchandise sporting the old logo. Consequently, Deseret Book is offering discounts on the old merchandise through the end of November. On 29 October Ancestry.com added an index to their 1921 Census of Canada database. They posted the images back in August at which time they were available free of charge. With the release of the index, I was no longer able to access the images for free. For more information about Canadian Censuses, see “Canada Census” in the FamilySearch wiki. Ancestry.com alerted me to other databases released in October. The only other multi-million record database was 30 years of the Harvard Lampoon. Okay, maybe I’m misrepresenting the “U.S., School Catalogs, 1765–1935” database a little bit. “This database contains a variety of publications listing names of students, faculty, alumni, and others associated with U.S. educational institutions and associations.” But the Lampoon is among its 5,378,762 records. I wonder if you could tell me if we can view anywhere on Ancestry.com the information that was on WFT disks? Also, would you be able to view that information on the library edition of Ancestry.com? I asked Ancestry.com about World Family Tree (WFT) accessibility. As you probably know, World Family Tree was/is available for purchase on CD-ROMs and is also accessible online at Genealogy.com, a website owned by Ancestry.com. Ancestry.com told me that the user agreement with the contributors prevents them from making the data available on Ancestry.com. It was a usual practice back in the days of indexing the U.S. censuses to use other census years to help decipher hard to read text. I admit; I did it too. But I always wondered if the extra work would go for naught, knowing that an arbitrator might not be as diligent. I always wished I had a way to enter a note that was sent to the arbitrator, explaining how I had deciphered the entry and asking that they give extra weight to my efforts. The indexer had found Bricius spelled differently in the 1860 census, so had made a note of it as part of her name. Now Bricius’s name is “Bricius (Briceus-186o Cs)”. Likewise with “Reymond (Raymond-186o Cs)”. This entry is doubly disturbing. Why in the world did the arbitrator not fix this? And how did FamilySearch allow it? It would be a simple computerized check for FamilySearch to detect this aberration. It could have automatically been flagged for intervention. Perhaps it could have been sent back to a FamilySearch missionary or another arbitrator. Two arbitrators would need to agree that the entry was an acceptable exception to the rule. If anyone at FamilySearch is listening, perhaps these suggestions could be incorporated into next year’s new version of FamilySearch indexing. Darned those overly helpful indexers! 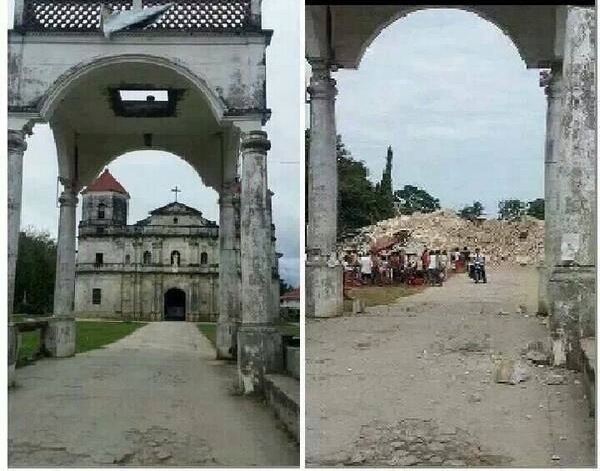 A destructive magnitude 7.2 quake hit Bohol, Philippines in mid October. There were 222 reported dead, 8 missing, and 976 people injured. There were 69,000 structures damaged or destroyed. Among these were centuries old Catholic Church buildings. A coworker pointed me to an article written by felvirordinario, Filipino genealogist and blogger. He, first acknowledging the human tragedy, next turned his thoughts to the survival of the old Church records. As an advocate of records preservation, one of my first concerns were the records found in these churches. What of them at the face of this great catastrophe? Were they destroyed along with the structures they were housed in? Read his article “Forever Preserved: Genealogical Records after the Bohol Quake,” to learn if the records survived and the role FamilySearch plays in record preservation. Credit: Peanuts Worldwide LLC. Visit the official website at http://www.peanuts.com/ for more fun. I’ve written before about the Misbach, colorful fan-charts that can be printed for your FamilySearch.org Family Tree pedigree (below left). Now you can do the same thing from within Family Tree (below right). The Misbach 9-generation chart is slightly more utilitarian and nicer looking by using a greater number of shades of each color to highlight 16 family branches compared to FamilySearch’s 7-generation, four-branch version. But the FamilySearch chart wins for convenience. To produce the FamilySearch chart, click on the printer icon above and to the left of the chart. Or from the Person page, click on Fan Chart in the print section on the right-hand side of the page. It may take a moment or two for FamilySearch.org to create the PDF file, which can then be printed or supplied to a business that prints large charts. Family Tree has the ability to reorder sources on the Person page. Hover over a source and arrows appear to the right of the source. Click on an arrow to move the source up or down. To provide feedback to FamilySearch, scroll down to the bottom of a page and click on Feedback. Select Suggestion, Compliment, or Problem. This should not be used to report misindexed names.